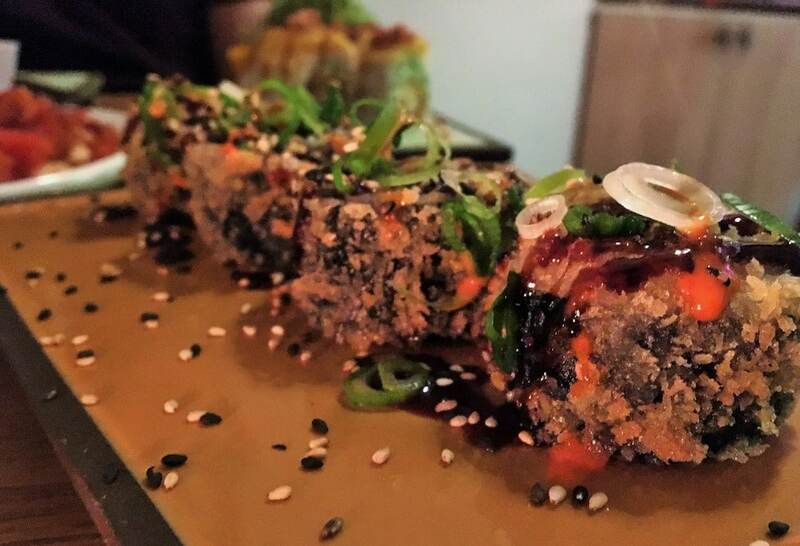 Let’s start by getting you to forget everything you know about sushi. Yes, all of it. It makes me want to weep when people say they hate sushi because it was never meant to be this way. Not limp, refrigerator-tasting, chewy, or devoid of flavour. Not crammed into a box at 5am to sit all day until a tired, health-conscious owner claims it, taking a mental note to give it a wide berth in future. I blame the supermarkets for a world flooded with bad sushi, but I don’t blame anyone for saying they hate sushi. They are entitled to their opinion. But they are wrong. So, yeah, I’ve had the good stuff and I’m a bit of an uptight traditionalist when it comes to raw fish and rice, but I’ll support anything that helps people understand they actually like sushi. Repelling the idea that raw fish is weird or dangerous is a matter of trust. Once understood, mediocrity just will just no longer do. 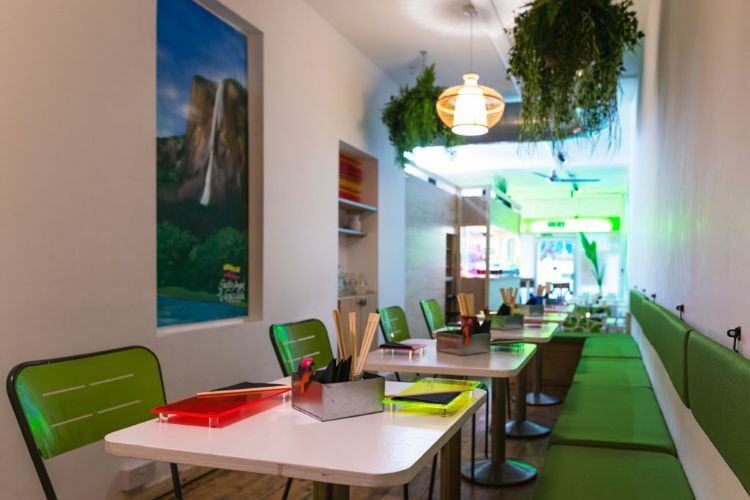 I’m romanticising about how this Latin fusion will work on arrival to Tropical Sushi on Western Road. I’m cautious. I do know that Japanese fusions are massive in South America, the hallmark of over a century of Japanese migration across Peru, Chile, Brazil and even Mexico. On arrival though, I see no signs of this upbeat Latin-Sushi olio, just a shopfront of factory metal and fluorescence. Walking into this place, I feel like I’m wandering onto the set of Baz Luhrman’s Romeo & Juliet through a Tracey Emin exhibition. Is this really it? Once firmly inside, there is no hint of club-like atmosphere. 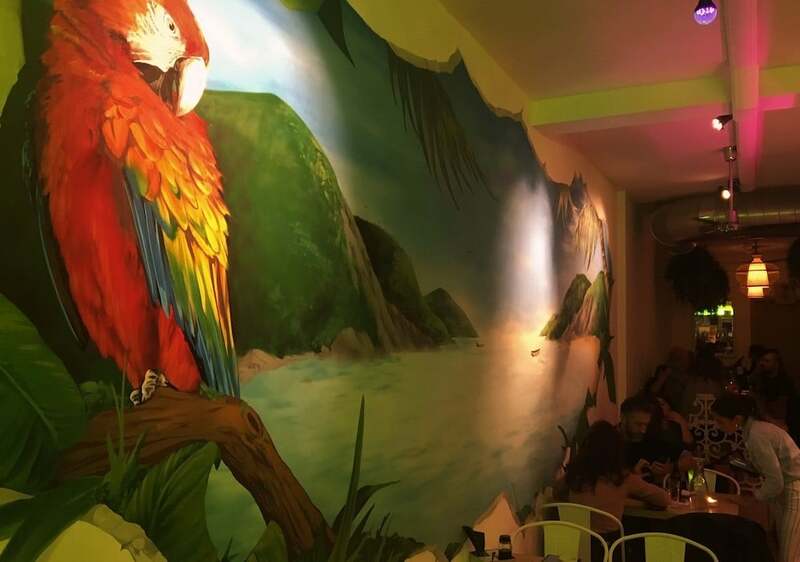 Instead it’s more Social Club, candlelight dancing with a kaleidoscope of coloured light and murals, pink and green lights splashed across wood and rafia. Reggaeton plays out, just the naughty side of gentle. I’m eavesdropping when the Negronis arrive. To my far left it’s a melting pot of cultures within one Spanish-speaking group. They are examining their sushi with surprise and squealing with delight. A couple arrive for a first date and quickly find talking point with the décor. I can actually feel the enjoyment of the group to my right who I later find out are here to judge the Brighton Restaurant Awards 2018 (BRAVO 2018). 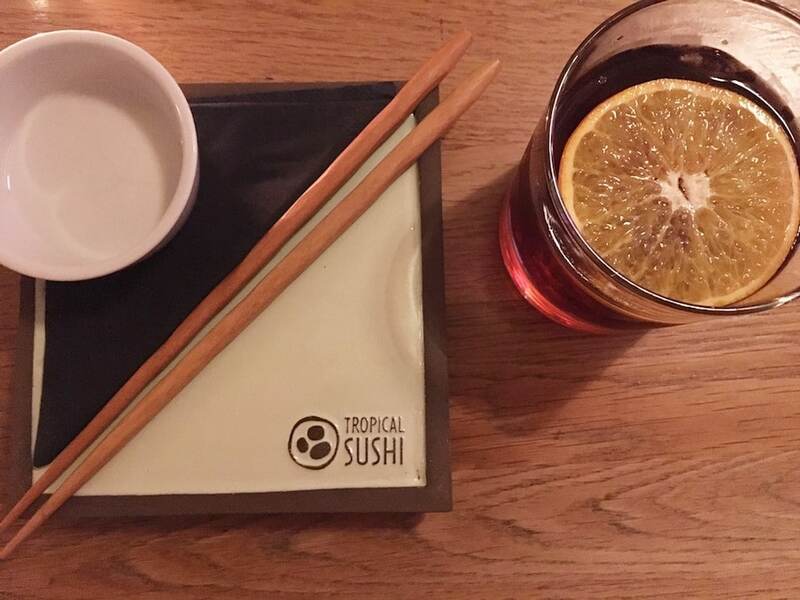 Unsurprisingly, Tropical Sushi has won the category for BEST RESTAURANT ON A BUDGET ! I mean, it is. Plywood panels have been fashioned into roller doors. Raw metal sheets form a Front of House desk. It’s trendy, eccentric and unrefined except in the finer details, which include monogrammed plates in lovely, vibrant colours. Helen’s answer will cement my love for Tropical Sushi forever. 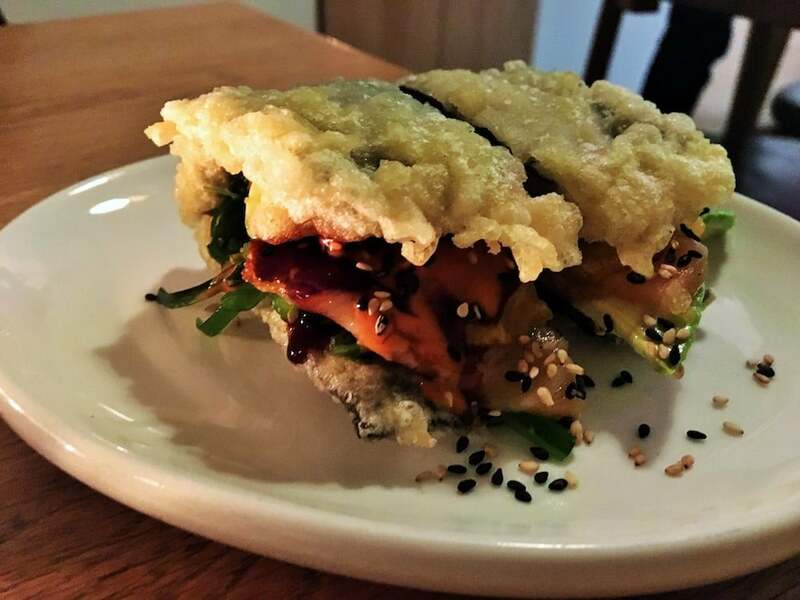 A “Tronchi Taco” arrives, that is (OK, breathe) – a salmon-avocado-wakame-tempura-nori-taco- shell brimming with fresh picadillo and drizzled with what I’m told is “Eel and Spicy Mayo”. Bloomin heck. I can imagine that eel, as I wrestle the taco into my mouth with both hands and take a firm bite. “Ohhhhhr”. And, suddenly, in that moment I can see that every bit of that start-up budget that has been freed up is right here in this incredible food. This is not neat, polite, maturely-balance-atop-chopsticks sushi, although classic menu choices are an option and I don’t doubt they too are phenomenal. But we’re on a different journey and ours starts with this glorious diner-snack. A satisfying, soak- up-your-Negroni, lip-smacking flavoursome sushi-like taco with a deep Panko-crunch, crisp spring onion and a rich centre of salmon. Also on our journey, a spidery bowl of tempura prawns, like a friendly hug from a gentle Sumo. It’s teamed perfectly with a fine, minerally Vinho Verde, from a fine looking wine list. 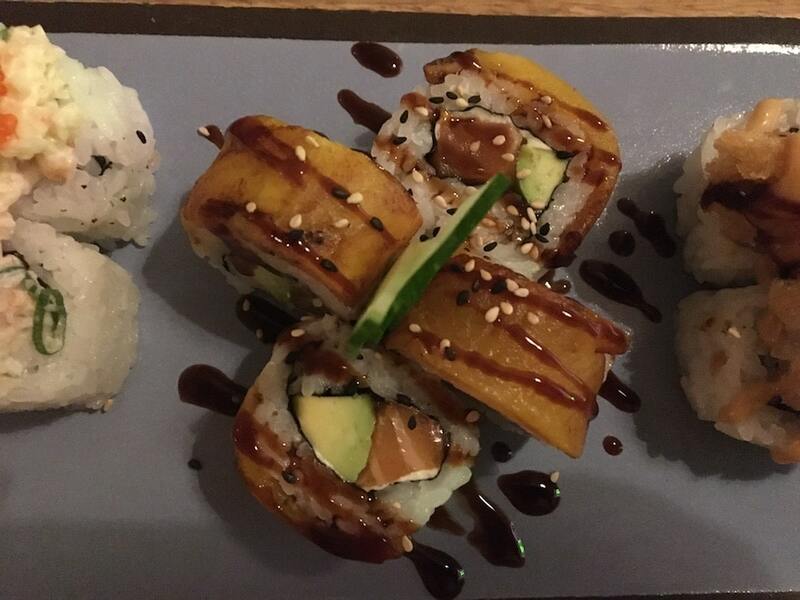 Next, a line up of hybrid, all singing-and-dancing sushi rolls. This is all new territory and the cavalcade keeps coming. These exquisite little ‘Franken-sushis’ have intriguing names like ”Andrea”, “Orlando” and “Veggie Preston Roll”, which are red herrings that offer literally no clue to their constitution. The only way to know them, we discover, is to bite mercilessly into them. “Andrea” turns out to be a prawn roll, accompanied by a little hat of fried popcorn-sized prawn, smothered in a teriyaki mayo known only as “Fuji sauce”. 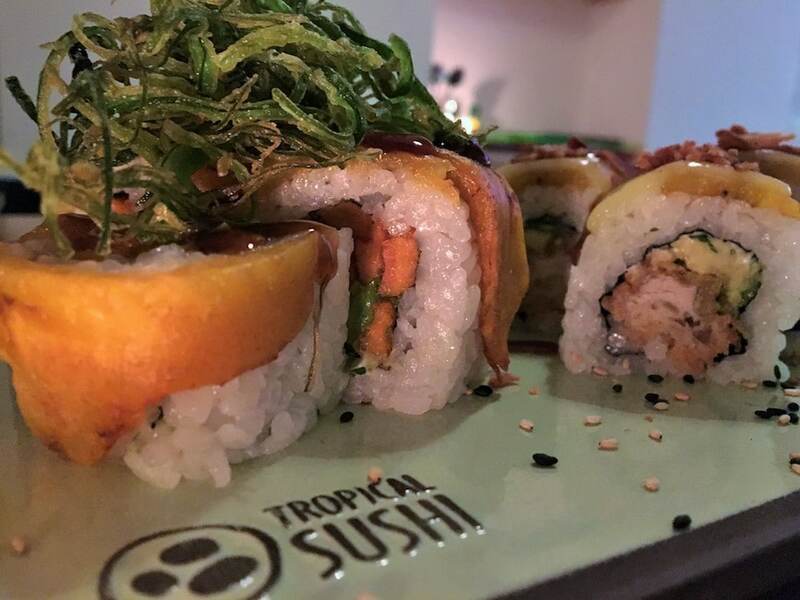 The “Tropical Roll” carries a signature slice of plantain, cut thin to create a delectably superb twist on the classic California roll. It is a stunning combination. “Veggie Avila” balances perfect, creamy avocado with sweet potato and little jungle of deep-fried wakame. It is both satisfying and glorious, a vegan win. “Preston” combines mushroom tempura, fried tofu, optional queso crema and more of that moorish Fuji sauce. 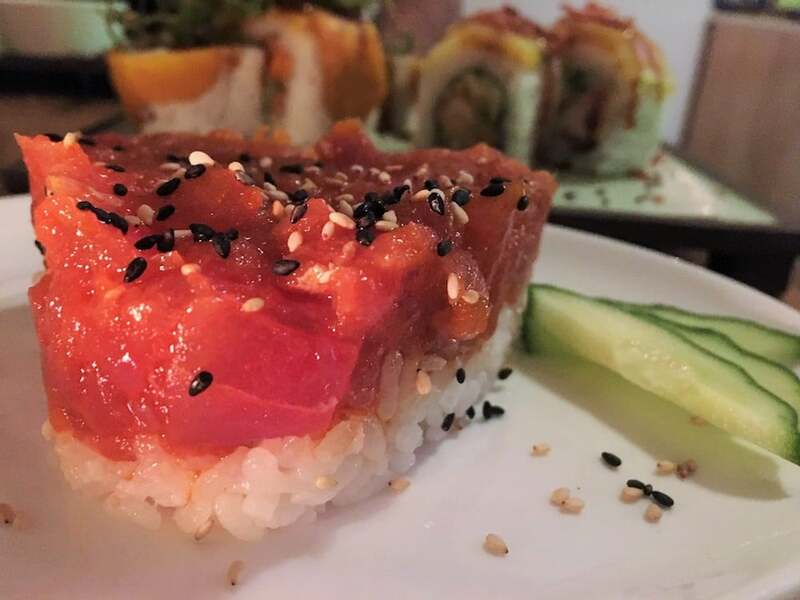 The light, spicy Tuna Picante is fantastic, but roll out the fanfare for the “Orlando Roll”, a round parcel of salmon, herbs and plantain, tempura’d and flash-fried for a delicious moment. This technique is also applied to my now favourite ever fusion, the “Tiger Roll”, which is a miracle that counts just four ingredients, one of which is spring onions. It is this I now dream of, its nutty crunch, sharp teriyaki drizzle and hailstorm of black and white sesame seeds. The Western palate doesn’t always prize the gelatinous, but there’s a satisfaction in desserts like mochi that when stretched, pull apart to reveal a gooey centre. Whatever your feeling about mochi, this is some of the best and I love that Tropical Sushi has championed this dessert. 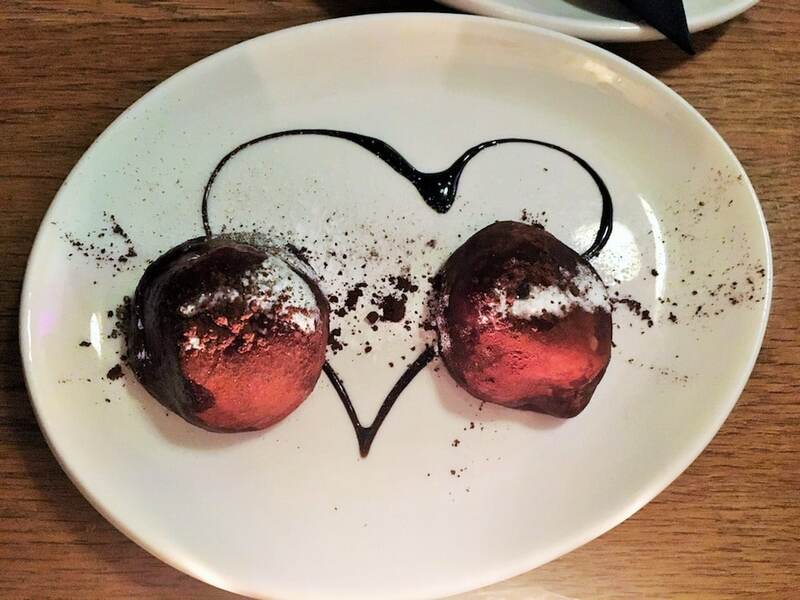 They pull off these chocolatey parcels in style. All of these combinations are truly original, truly delicious, and truly thoughtful. 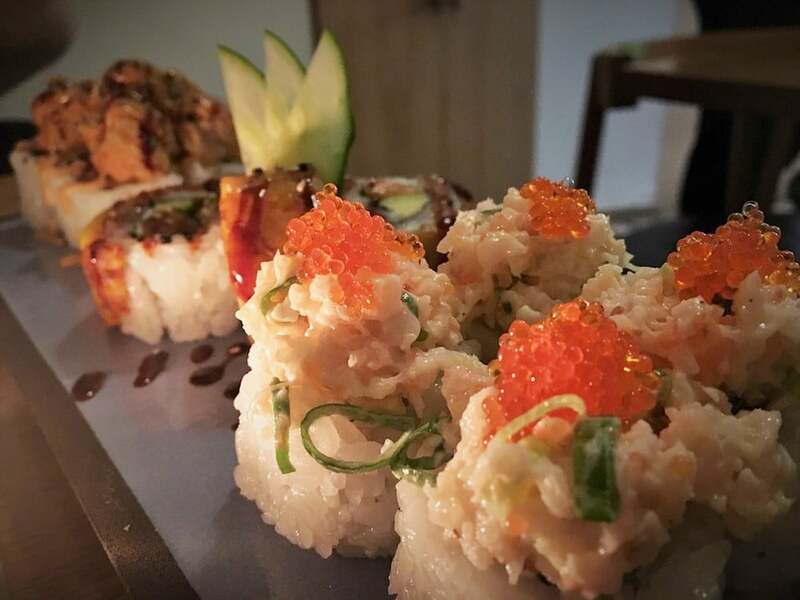 In each assembly, a rich yet sushi-light quality that feels both comforting and wholesome. There are signs, too, of a willingness to try something risky and new. 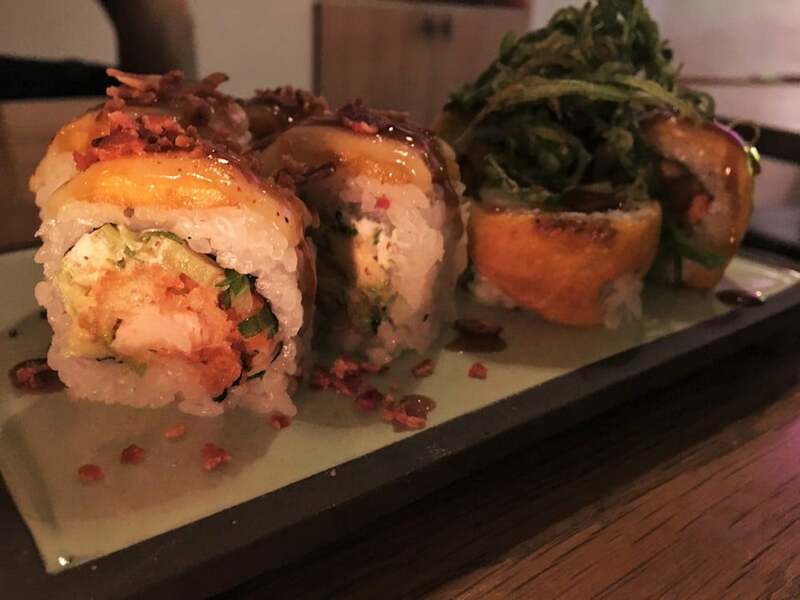 All hail the perfect bridging dish for the fusiest of sushi-hating friends, the “Po-Yo” teriyaki chicken roll with its shameless topping of bacon and Gouda cheese. I can just see Jiro wince. 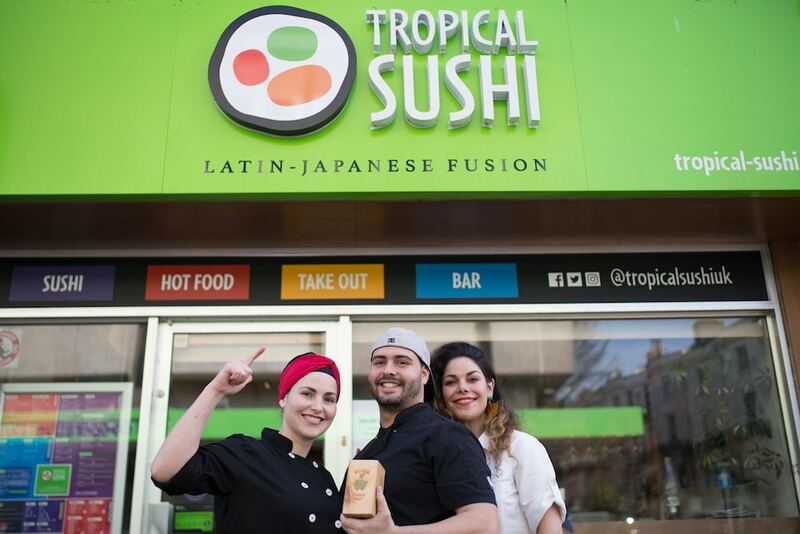 Whatever your thoughts on fusion or sushi you have to admit the young, ambitious team at Tropical Sushi nails both. 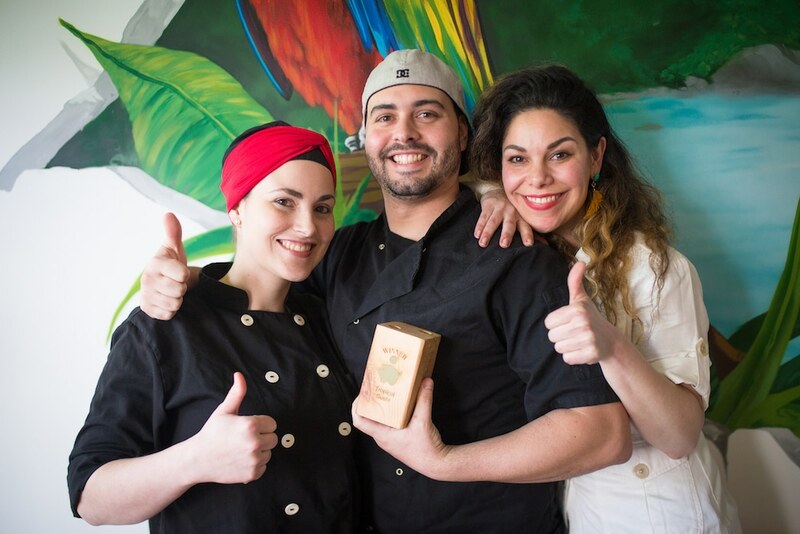 The result is a loosening up of cultures, attitudes and belts and a welcome taste of lively Latin life in Brighton and Hove – started on a shoestring and destined for amazing things.